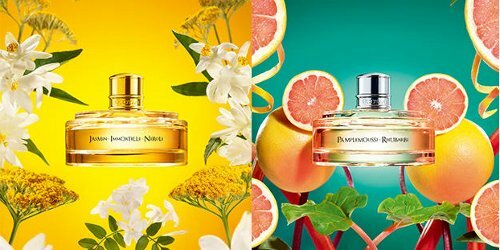 Jasmin Immortelle Neroli and Pamplemousse Rhubarbe are the latest from L'Occitane, part of a new limited edition collection developed in collaboration with pastry chef Pierre Hermé and inspired by summers in Corsica. Both scents sounded tempting (if perhaps not as tempting as they might have been if they'd been inspired by Pierre Hermé's pastries) and I'm happy to report that I liked both of them: a set of scented hand creams was bought and paid for within minutes after smelling them. With neroli, pink pepper, jasmine, orange blossom, immortelle, white wood, amber and musk. Verdict: Jasmin Immortelle Neroli is a cheerful blended floral, very wearable, and light enough to work well for office-wear. As is frequently the case with L'Occitane fragrances, I smelled it, thought it was awfully nice for a mall chain, then remembered the prices, which are higher than I generally expect for a mall chain (regular readers have read this complaint from me before, and can roll their eyes and move on) and higher than I'd pay for a juice of this sort. Another way of putting it is that I do think you can do far better for the price. I did buy the hand cream trio (I'm a sucker for scented hand creams) but even the shower gels ($20 for 250 ml) struck me as just a shade too dear. With grapefruit, rhubarb, lemon, clove, nutmeg, cedar and cypress. If you and grapefruit fragrances don't always get along, turn your head when you spray and perhaps even hold your nose for a minute: this one has a bit of a sulfurous start. On my skin it settled quickly into a tart, ultra-crisp blend of grapefruit and rhubarb. The slightly-sweaty undertones from the grapefruit are given extra bite by the spices, which are briefly strong, then soft, and lent warmth by the somewhat heavier woody base. Verdict: I don't know if they're positioning Pamplemousse Rhubarbe as unisex, but they certainly could have — there's nothing feminine about it at all, and some women may find the combination of grapefruit and cedar too masculine to wear. Many perfumistas are already familiar with the pairing of grapefruit and rhubarb via scents like Hermès Rose Ikebana and Eau de Pamplemousse Rose, or Miller Harris Le Pamplemousse, among others. If you liked those, you might well like the L'Occitane too; I certainly do. The warmer, spicier finish gives Pamplemousse Rhubarbe more of a three-season feel, and it lasts quite nicely on clothing. On skin, admittedly, it fades a bit sooner than I like, but then, so do the Hermès entries. I am going to be keeping my eye out for a sale on the body products for this one. Both scents come in cheerful paper cartons, ready for gifting. 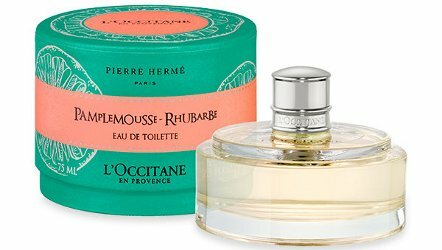 L'Occitane + Pierre Hermé Jasmin Immortelle Neroli and Pamplemousse Rhubarbe are $62 each for 75 ml Eau de Toilette. There are also a variety of body products (some also in a third fragrance, Miel Mandarine) and gift sets. At the moment, $72 gets you the "Collection", a gift set with the 75 ml Eau de Toilette plus Shower Gel, Body Milk and Bar Soap. 1. Happy888Cat commented here that Jasmin Immortelle Neroli "could easily be part of the Grasse collection" and I do think that's absolutely right. It's in a very similar style, quite different from the older Voyage en Méditerranée / Notre Flore collection. I will check these out – they weren’t yet available last time I was in a L’Occitane store. I suspect these will be a bit too nice for me, but Holidays are coming and L’Occitane hand creams and body products are always great gifts. Some of the gift sets for this collection are really nice — the trio of hand creams was $29 USD and would make a decent gift. Also at the moment hard to see why you’d pay $62 for the perfume when for $72 you’d get a whole set, but I assume those sets will sell out faster than the perfumes. I have really liked several of their fragrances right up until the musk rears its ugly head, and they become scrubbers. I have given up trying anymore, which is a shame, because I really do like them right out of the gate, and this jasmine sounds nice. Oh too bad. Is that with the body products too? Body products are hit and miss… some do, some don’t. I love the scent of the peony lotion, in particular. Problem is, I am not crazy about the way they feel on my skin. I’ve yet to be impressed by a L’Occitane fragrance, though I do love a short, squat bottle. Something about it makes me want to put it in my hand. The bottles have a nice feel, but are a bit plain otherwise. If you’ve yet to be impressed, doubt these will change your mind. The closest they’ve come to perfumista bait yet was some of the Notre Flore collection, I think. It was their Eau d’Iparie which led me down the rabbit hole and into the blog world in looking for a bottle after it was d/c’d. That was a nice incense and kind of out of their safe selection. These sound nice. I’ll definitely give a sniff, at least. I smelled these at the mall this past weekend. I liked the grapefruit one better but not enough to even be tempted to buy a bottle. OTOH, there were plenty of Advent calendars to be had and the contents were “not bad”. Do I need $49 worth of mini trial sizes, stickers, placecards, candy cane (1)? Nope. I am not tempted by either bottle, but will not be surprised if my hand creams are joined by other products…assuming they do not sell out before they get marked down. I am a self-proclaimed macaron expert and have to say that I was disappointed by the prosaic design of the bottles. I only smelled the Jasmin Neroliand was anticipating a stronger almond note, given that almond meringue is the foundation of the princely macaron – no relation to the pedestrian macaroon. Sorry coconut lovers! I did not even know the bottles were supposed to look like macarons? But certainly neither of these is a conventional dessert-ish gourmand. According to the SA at the store, the bottles are supposed to evoke macaroons. My reaction was “Huh? Hmmm… ” Then again , I suppose her word on the matter is questionable since this is the time of year when we see holiday temps in stores with so-so product knowledge. By the way , my favourite flavours are floral of course i.e. Orange blossom , rose, and Earl Grey. My friend likens eating macarons to eating perfume ???? Oh, quite possibly they were right…I’ve read nothing about the packaging. How is the miele mandarine hand cream? Of the three scents, that’s the one I’m most interested in so it’s a pity it’s not fully available over here. I am still waiting for it to arrive! I will almost surely post something about the creams when they get here. And I was interested in that one too, wish they’d done it in an EdT. I agree that this collaboration is rather lovely. I just wished they attempted at least one gourmand scent though. If my memory serves me right, Miel Mandarine is the “weightiest” one of the bunch (relatively speaking) and I too want it in perfume. I am baffled as to why they paid so little attention to this one..
Good, very much looking forward to my MM hand cream. And thanks for the verification on the bottle!